Educate the Children offers an opportunity to sponsor an entire pre-primary (pre-school/kindergarten) classroom in a Nepali village. We know that quality early childhood education helps children form good habits of regular attendance, paying attention, and socializing well with peers that will serve them well throughout their lives. And we know that properly trained teachers encourage their students’ holistic development and prepare them for higher grades. We must invest in early education to help young children succeed! 1. Furnishing and providing supplies for the classrooms. ETC provides child-sized furniture and useful classroom materials such as educational games, charts, art supplies, white boards, shelving and storage units, and recreational equipment (e.g., balls, jump ropes). 2. Training teachers. 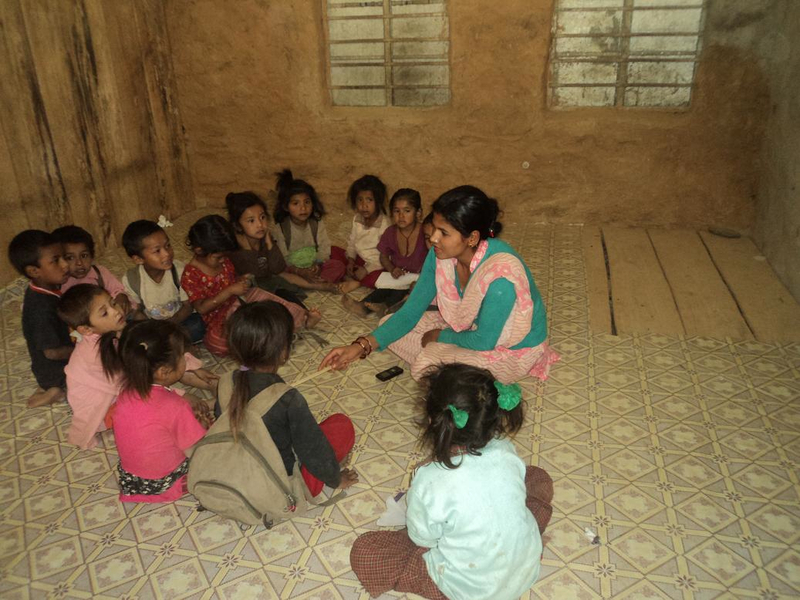 Most early childhood educators in rural Nepal are young and inexperienced women who have had only minimal training and are not very aware of best practices in working with children ages 3-6. ETC’s training opportunities cover important topics such as classroom management, creating teaching/classroom materials, and lesson planning. 3. Launching and facilitating professional early childhood education teachers’ networks. Through their participation in regular peer network meetings, the teachers can share successes and challenges and learn from one another. This opportunity greatly enhances both their confidence and their commitment to their jobs. 4. Making necessary physical improvements to the classrooms. Even before the 2015 earthquakes, many classrooms were in poor condition. Since then, the need has become even greater as most children are still attending school in temporary facilities that are neither weatherproof nor very inviting or comfortable. ETC works closely with school personnel to determine and prioritize their needs. For more information, contact Teressa Naylor at info@etc-nepal.org. You may use the PayPal menu/button below to sign up for or renew a sponsorship. Please note that you do not need to have a PayPal account; you can simply use your credit card.